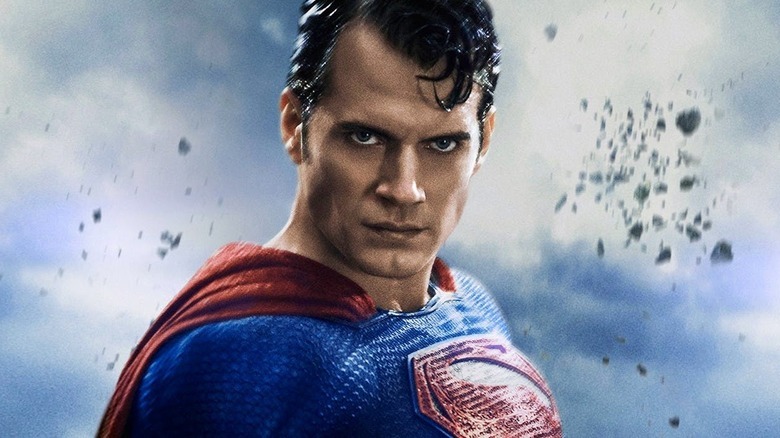 Henry Cavill isn't swinging his cape away from his Superman post just yet — according to fellow DC Extended Universe actor Jason Momoa, that is. Momoa, who is in the final countdown to the wide launch of his own superhero solo movie, spoke with Entertainment Tonight during the red carpet event ahead of Aquaman's world premiere on Wednesday, December 12. Asked to address the rumors that Cavill would soon hang his cowl, stepping away from the Man of Steel mantle for good, Momoa swiftly shut down speculation. "He's absolutely not," Momoa said when the reporter brought up talk that Cavill was moving on from Superman. "He loves the character and he's not, 100 percent." "So that's not gonna happen?" she again asked Momoa. He answered in no uncertain term that Cavill's exit is "absolutely not" happening. This is a surprising turn of tone on Momoa's part, as the actor implied during a December 8 conversation with Huffington Post that not only Cavill but also Ben Affleck truly do plan to say sayonara to their respective superhero roles as Batman and Superman — back-channel chatter that The Hollywood Reporter broke in September of this year. At that time, THR reported that Cavill was "parting ways" with Warner Bros. and DC Films, joining Ben Affleck as "a hero on the way out." The outlet also cited a studio source as saying, "Superman is like James Bond, and after a certain run you have to look at new actors," and an insider as noting that Warner Bros. is "trying to hit a 'reset' button with the DC universe, steering its ship slowly into another direction." With HuffPost, Momoa seemed to hint that those claims might be true, revealing that he totally understands why Cavill and Affleck would want to depart from the DCEU. "If they're both out, then listen: It's just the place they're at in their careers. I mean, how many has Henry done? He's done three?" said Momoa. "Yeah, I mean, like, you want to move on. I think if I did… s***, I have done three." He continued, "I mean, Henry wants to just expand on something. Ben is an amazing director that is of age, and probably he's done enough. I don't know how to speak on behalf of them, but I had the time of my life [on Justice League]." Momoa did take time to praise Cavill and Affleck, though. "Henry is the gentlemen who taught me when I came on not knowing anything. I'm like the ruffian hooligan, and he's just like, 'There's kids watching,' and I'm like, 'Oh, yeah. My bad.' He is totally 100 percent the Superman for me," he said, adding, "Ben is just a phenomenal director. I just love picking his brain because he's what I want to be as a director. I love filmmaking and that process, and I enjoyed Ben's company, because when I see him in pain, putting that cowl on, he's in pain. That makes me happy, and a joy to get through. We all have to put these suits on and get through grueling times. When he's in pain, and I can see it happening, it just tickles my heart." Less than week after Momoa made those remarks to HuffPost, it's sounding like he realized he may have spoken out of turn when it comes to the "Cavill potentially ditching his Superman gig and Affleck waving bye-bye to Batman" situation, and tried to backpedal when chatting with Entertainment Tonight. Since the publication of THR's original report, a spokesperson for Warner Bros. issued a statement detailing that the studio has "a great relationship and great respect for Henry Cavill that continues to remain unchanged," and that "no current decisions regarding any upcoming Superman films" have been made. Sure, Cavill posted that bizarre Instagram video of him holding a Superman action figure while a dog-bark rendition of "The Blue Danube" by Johann Strauss II played over the footage, which re-complicated the whole ordeal, but maybe the actor didn't mean anything by it. After all, Cavill's manager did confirm that "the cape is still in his closet," and that his partnership with Warner Bros. is still strong. One would assume that, given how close he and Cavill are, Momoa would know what's going on with Cavill's connections to his Superman role. Maybe the Brit genuinely does want to dip out of the DCEU in the future, but isn't planning on doing that for a few more years. Perhaps Cavill is hoping to broaden his horizons (and he already has done by landing the lead role on Netflix's television adaptation of The Witcher), but isn't looking to leave the superhero movie world completely in order to do so. Until Cavill speaks on the situation himself, we'll just have to take everyone else at their word — no matter how contradictory they may be.